lets hope it will materialize and will be good..
oops! totally forgot about the testing days! oh, i hope Kimi gets to test the new parts! Vettel is having his new chasis already this weekend, Ferrari is taking to long. 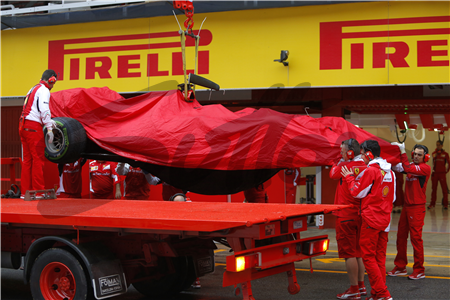 The wheels could well be coming off the Ferrari band wagon, and quicker than we all expected. Though, Fernando Alonso for a change is behaving himself. His sojourns in twitterland during this season have been restricted to banal ‘hello’, ‘thank you’ and ‘goodbye’ type comments – mostly in Spanish and Italian. Yet as we observed yesterday, the handling of the Mattiacci affair becomes stranger by the day. Marco was forced to sit subservient and silent throughout a press conference given by Il Padrino last weekend in Barcelona – where the message from Luca was in effect, “I’m going to be rolling up my sleeves and doing the ‘day to day’ stuff for the next few months, because this guy hasn’t got a clue”. Montezemolo is now giving us some background on the decision to appoint Marco Mattiacci. He claims it was his decision alone Il Padrino already told us he did not want a ‘mercenary’, which presumably was the reason why James Allison was overlooked. Say what??? The selection of the next head of the Ferrari racing team was settled upon because Il Padrino didn’t have time to properly consider all the options??? Domenicali leaves suddenly and unexpectedly… Il Padrino makes a snap appointment… all none Italian Ferrari workers are mercenaries? This is PR mayhem… and during this mayhem, Il Padrino agrees to allow Ross Brawn and his mates to rock up in Maranello… to test some Ferrari’s??? If Mattiacci was appointed by Il Padrino, then the writing is on the wall for him. He is being humiliated by both Montezemolo and Alonso who have talked him into a corner this weekend. Mattiacci will not be able to make any decisions for months due to his “inexperience” repeatedly cited by ‘the head of the family’. Why would Il Padrino do this to his own appointment? Maybe because he has always been waiting for a certain someone to complete his gardening leave, and Mattiacci is a temporary puppet. However, if Mattiacci is in actuality a FIAT appointment – parachuted in over Il Padrino’s head, then expect seismic activity – greater than a count of 9 – soon in Maranello. In this scenario Il Padrino and Alonso’s behaviour is clearly an attempt to drive Mattiacci to quit.